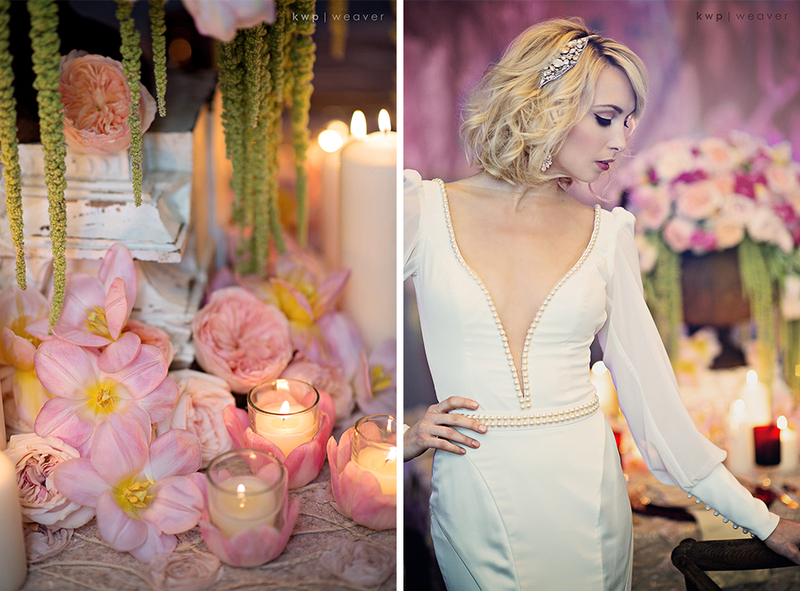 Part 2 of our Stylized Shoot was oozing with romance. 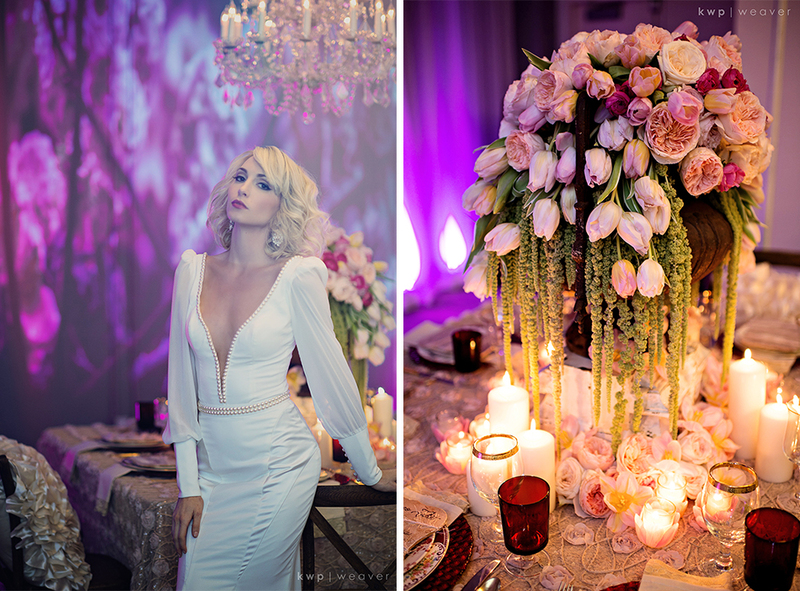 Our shoot was based on a ballet (this is part 2 of 3) inspriation and this time with the tortured romance of Romeo and his Juliet styled feast. We would like to imagine that if the two hopeless teens would have not tragically died that this would have been their feasting table that night. They would have ran off together, despite their parents, into a garden where the overflow of tulips would have beamed from the hues of candle light. See it HERE in motion! This table would not be found in a garden but rather at the Aloft hotel in Downtown Orlando Florida. We were taken back to another time and date with Jacob Towe’s gorgeous projected backdrop. 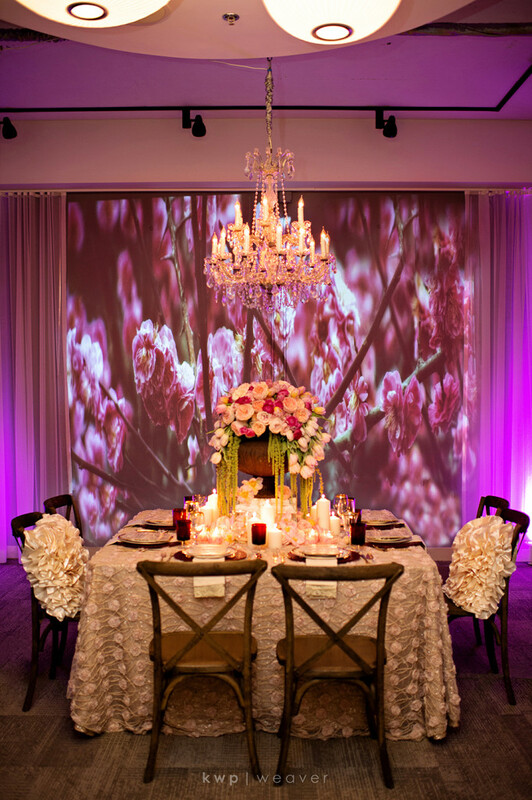 The chandelier provided by Blooms Inc and really brings the eye up into sparkly goodness making the table come into a more modern yet timeless time. The “french” chair by A Chair Affair is what grounds this table with a darker (but not too dark) tones. With the rustic element paired with Nuages’ sparkle underlay and garden rose overlay all mixes to bring us into a secret garden actual feel. The pillows, from Peir One, bring in a sheen and comfort to the chairs that lets the light bounce off areas that may have disappeared into the night. Wondering what the flowers are above? Well, don’t be afraid to play with floral to make into something original. These are just over opened tulips that we manipulated with our hands. Creates an element of surprise! Hope, our model, was the perfect modern day Juliet in this BERTA gown. The Erin Cole accessories are simply gorgeous! The deep pearl trimmed dramatic V neck balanced with the sheer covered arms- through to the cuffed wrists was the perfect gown for this scene. Is anyone else just DYING over the floral? This enormous urn was overflowing with floral. 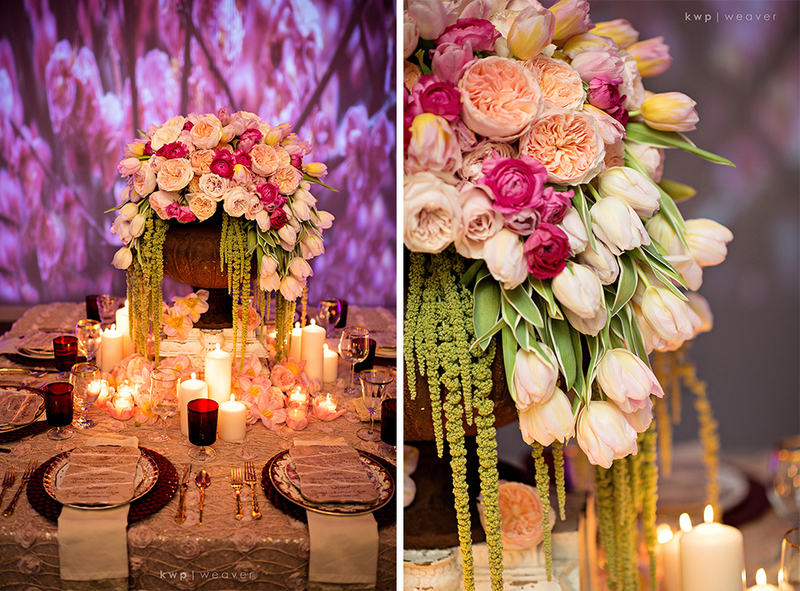 The way the tulips and amaranthus emerge from the roses and garden roses and how they are dripping into the floral at the base that creates a blanket like effect on the table. Looks and feels as if the floral is growing out of the table. Mixing in pillars and votives of different heights and widths give this candle light an extra something that makes the feeling even more delightful. By mixing two linen instead of just one, we created a look that has not been done before. We love sparkle (what girls doesn’t) but wanted to show a twinkle and not a massive sparkle. Just the soft touch needed for the lover’s feast. These tables were adorned with deep red accents (not too much otherwise it would have been too dark) which were glassware from Dishie Rentals and textured chargers from A Chair Affair. 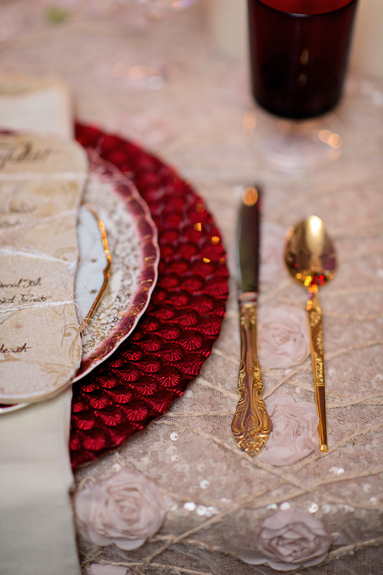 The exquisite china and gold flatware that looks like it came right out of Juliet’s hutch was also from Dishie Rentals and made the opulent touch we needed. The red acts as a dramatic change from all of the light and softness of the table. Contrast is always needed to bring depth to a table/space etc. The menu cards are wood cut outs (about 1/4 thick) that we made custom. 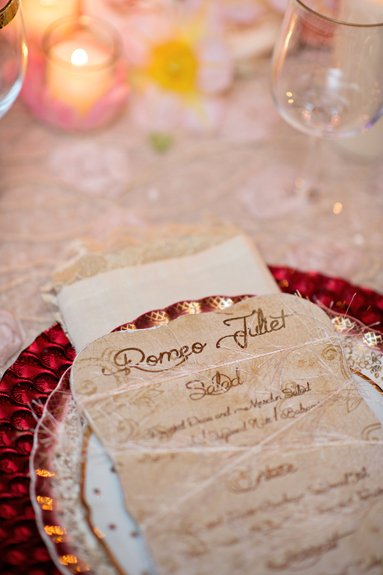 We picked a romantic font that we gold foiled and then modge podged them onto the wood with light sanding. 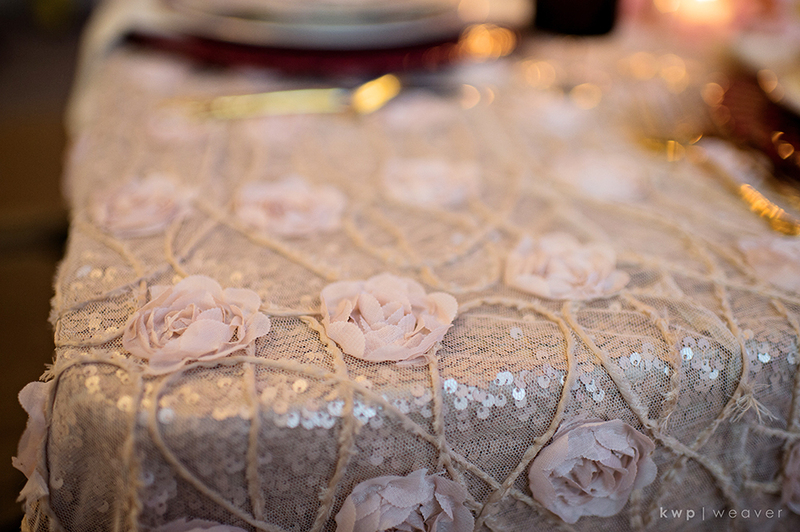 We wanted to add a texture by wrapping them with a sort of yarn that just had to be touched! Too bad Romeo and Juliet ended they way they did. Their romantic dinner would have been enough to bring both sides together. We hope you enjoyed our stylized tribute to the star crossed lovers. Thank you to everyone who made this possible!